A Toast by the Bride & Groom — Sweetchic Events, Inc.
Toasts at a wedding are always expected. 95% of the time, they are given by the Best Man, Maid of Honor, and sometimes the parents (one or both sets). One thing I ask each of my couples before their wedding day is whether or not they are going to give a toast. I usually get a look of surprise at first because it’s not something they’ve thought about, but I always encourage them to say a few words of thanks to their guests. In my opinion, it’s all about being a gracious host. Your guests certainly appreciate the fact that they have been invited to share in your happy day (not to mention wined and dined), but chances are, many of them have traveled long distances to celebrate with you. So welcome them! Thank them! Also give heartfelt thanks to those who helped make the wedding possible. And just as importantly, celebrate and toast each other. Even if you plan to circulate the room and greet people individually, chances are you may not have the opportunity to greet every single guest. By saying a few words, you ensure that everyone feels appreciated. 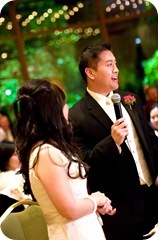 And for fun, here are some gratuitous pictures from our own wedding toast! So as you plan your reception itinerary, please consider giving a brief toast. It doesn’t need to be lengthy or overly thought out… Just be sincere!